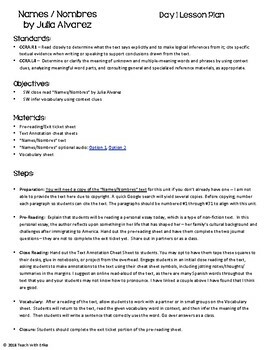 This 4 day mini unit for the personal essay / short story "Names / Nombres" by Julia Alvarez engages students in closely reading a text, inferring vocabulary using context clues in the text, answering text-dependent questions, citing evidence from the text, and writing a formal analysis in response to a prompt. 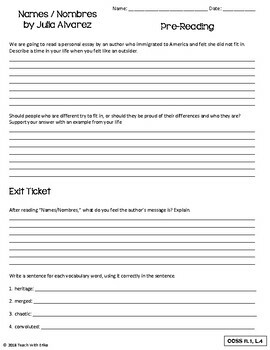 This is a great lesson to bring into a thematic unit or to pair with a text with a theme on immigration, identity, or self-acceptance. 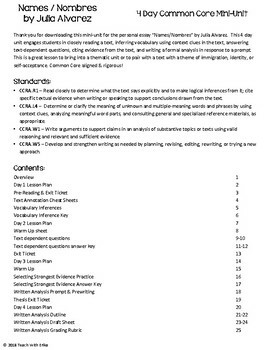 Focuses on argument/textual analysis to prepare students for a new generation of testing. Common Core aligned & rigorous! 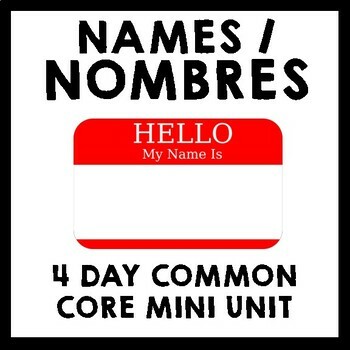 Please note: You will need a copy of the “Names/Nombres” text for this unit if you don’t already have one -- I am not able to provide the text here due to copyright. A quick Google search will yield several copies.